CUBA BRIEF: “Irma is not responsible for Cuba's economic debacle. The government is.” Tourist industry put profit over the safety of their clients. The Hill reports that Senator Marco Rubio (R-FL) wants reciprocity in U.S. Cuba relations: "I just think it is fair and, and reciprocal for us to require a proportional drawdown of the Cuban Embassy and the Cuban diplomatic presence in the United States," he said. ABC News reports that Tour companies, airlines, cruises and others in the travel industry will continue taking Americans to Cuba despite a dramatic safety warning issued Friday by the U.S. State Department. "We continue to believe that Cuba is a safe destination for our travelers.” Translation: Tour companies believe that their profits are more important than their tourists' safety. Consider a headline from The Independent (UK) on September: “Hurricane Irma: Holidaymakers still being flown to Cuba as storm approaches.“ According to the British paper The Independent one Thomas Cook aircraft “carried holidaymakers out to a location in the path of Hurricane Irma.” Back then the BBC reported that “British tourists in Cuba have been speaking of the impact of Hurricane Irma, with one saying the storm had led to the "honeymoon from hell". The U.S. tourist industry operates in a grey zone claiming that their tourists are not tourists. Because to acknowledge the obvious would get them into legal trouble since tourism by Americans to the island remains banned. The previous Administration with a wink and a smile told them “not to “worry” about it. As far as they knew they were not tourists but scientists researching water temperatures at Cuba’s pristine beaches, or the modalities of Cuba’s cultural heritage while they visited the famous Tropicana nightclub in the capital's outskirts. But what about the Cubans? 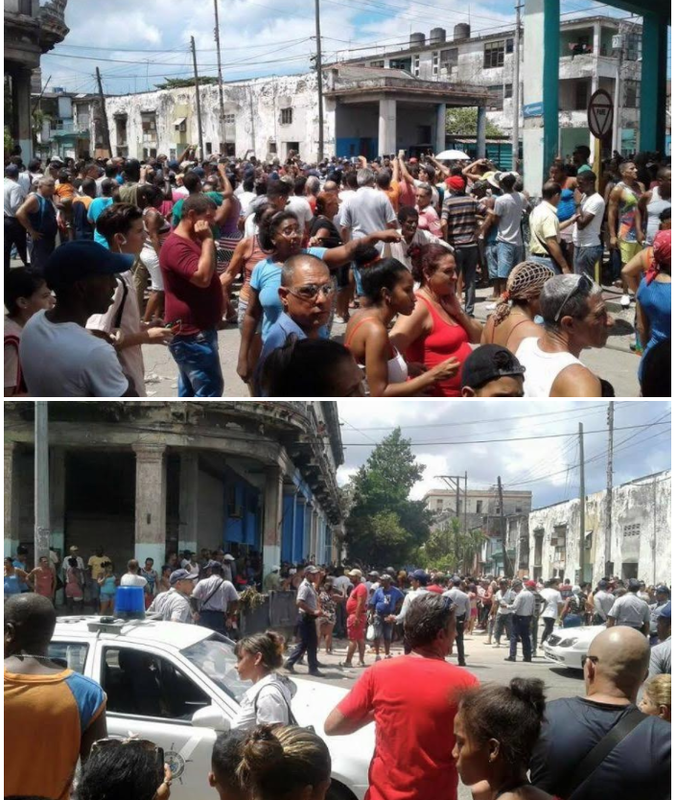 For the first time in many years several hundred Cubans demonstrated at various locations when they discovered that the hotels' water and electricity were restored while thousands of homeless Cuban families without water and left in the dark had to pay, albeit with a discount, for the emergency food provided by the regime. We are publishing photographs from the demonstrations. The government two track response was to restore water and electricity in several neighborhoods and the sudden appearance of the much feared black berets, anti-riot police, with dogs and all. And while General Raul Castro did welcome Venezuelan strong man Nicolas Maduro to Havana’s airport, Fidel’s younger brother has yet to tour the effected areas. Be that is it may, even in the middle of great tragedy Cubans laugh. The joke in Havana is that in the aftermath of Irma there have been dozens of casualties and one person missing. The missing one? General Raul Castro Ruz. HAVANA – I was visiting a friend recently, a well-known athlete, to continue our chats on the future of sports in Cuba. About 30 minutes later a friend of his wife arrived, a 27-year-old woman introduced to me as an Interior Ministry officer and member of the Las Marianitas brigade. “What are the Marianitas,” I asked. I asked if the name referred to Mariana Grajales, mother of Cuban independence hero Antonio Maceo and herself a lifelong fighter against Spanish colonial rule. “That's right, named after Mariana Grajales because we are valiant defenders of the Revolution,” the woman added, still smiling. Of course my friend the athlete and his wife knew that I am a journalist with the independent DIARIO DE CUBA. But they said nothing to the Marianita so I could learn something about the brigade, part of State Security, whose only job is to violently repress the dissident Ladies in White. I learned very little. In effect, as the Marianita said, their only daily responsibility is to “steamroll those screaming mercenaries paid by the Americans to put on those clownish activities. But learning that there's a MININT brigade of women officers created specifically to repress the Ladies in White, and that the brigade was named after Mariana Grajales, was enough. Enough to understand that Gen. Raul Castro cares little about using government funds to repress a peaceful group of women, instead of attacking the alarming wave of violence and gang activity that fills Cuba's streets and neighborhoods. “What's the cost of just one day's repression of the Ladies in White?” I was asked a few months back by a friend, an accountant, as we watched the video of an attack on Berta Soler, leader of the women's group. “It would be good if the opposition activists who count the number of repressive attacks by the government could also add up and publish the costs of those acts, so that the people would know how government funds are spent,” my friend suggested at the time. Based on reports and videos published in non-government news media, we can say that one single act against one single member of the Ladies in White required the use of two police cars, half a dozen uniformed police officers, and another half a dozen State Security agents on motorcycles. How much does something like that cost? How much does the Las Marianitas brigade cost? Gangs and violence yes. Ladies in White and peaceful activities no. Yinett Barrio was murdered Sept. 1 in her home on Sol Street in Old Havana. One police car arrived 20 minutes after neighbors called and reported that the killer was still in the young woman's house, murder weapon in hand. Last week, two gangs named Los Apululus and Los Atormentados exchanged gunfire on the corner of Esperanza and Recreo streets in the Havana neighborhood of El Cerro. Twenty minutes later, one police car arrived. No one was arrested, no witnesses were questioned. The two gangs, which have been preying on old people, were the topic of a Diario de Cuba report in November of 2015. 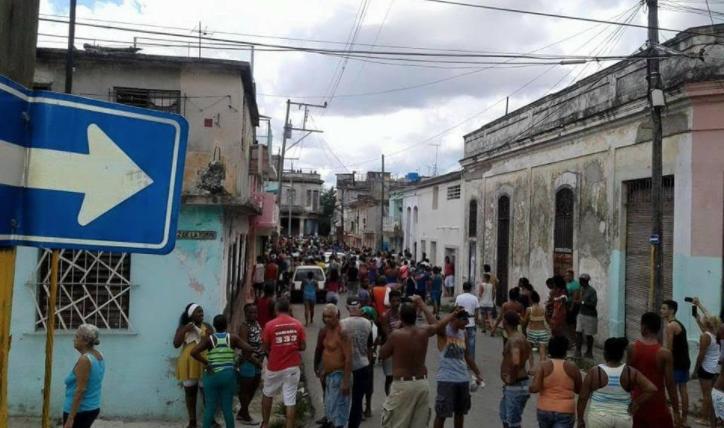 During the month of September, the Belen and Jesus Maria neighborhoods of touristy Old Havana saw five fatal stabbings. Residents said police have done nothing about the crime wave, although police officers are posted on each corner of popular Obispo Street. “Gangs and violence yes, Ladies in White and peaceful activities no,” my friend the athlete told the Marianitaafter recounting those three examples of violence. Then she quickly asked me to any videos I had about the repressions against the Ladies in White. “I want to see, with my own eyes, how in hell the other part of my salary is spent,” she said. Following Hurricane Irma and its 150 mph winds, the outlook for northern Cuba is desolate. Homes and crops were knocked down, and thousands of homes remain without electricity. “The damages appear to be huge, no doubt,” Cuban economist and human rights activist Elias Amor said by phone from Spain. But Amor and other experts told 14ymedio that the Cuban economy's key problem was not the recovery from Irma's damages but the government's mismanagement of the economy, which is again in a recession. Even before Irma hit, Amor said, the drop in export revenues from Cuba's refining of Venezuelan crude, and the drop in income from government-organized groups working abroad – estimated at more than $1 billion – had already dealt a powerful blow to the economy. “Irma is not responsible for Cuba's economic debacle. The way in which the Cuban government has managed the national economy for decades is,” Amor said. “The hurricane only added to the problems, because the situation was already critical before,” said Amor. “Cuba was having to pay more for imports because the U.S. dollar, the currency that it receives for the great majority of its remittances, is very weak.” The economist also predicted that remittances from Florida will not increase because of the damages Irma caused in South Florida. “The harvests on lands leased from the state also have not been as good as expected, because the farmers lack incentives to produce and face many difficulties finding supplies,” said the economist, underlining the island's complex economic picture. Amor, who is president of Cuban Observatory for Human Rights, noted that the government has issued no estimates of Irma's damages, even though several Caribbean islands, Puerto Rico and Florida have. “On one hand, it may be that the damages are huge and they don't want to alarm people. Or maybe it was not as destructive as believed, and they want to manipulate the data to blame the hurricane for the economic debacle,” said the expert. Morales said images of post-Irma Cuba resemble “the worst of the Special Period,” the crushing economic collapse that followed the disappearance of the Soviet Union and its massive subsidies to the island. Tourism, one of the lead sectors of the economy, took a direct hit from Irma. Tourism Minister Manuel Marrero has said the hurricane caused a 50 percent drop in visitors and damaged 26 percent of the hotels in Varadero, the island's iconic tourist center. But Marrero gave no details on other important centers for Canadian and European tourists. The airport that serves the Cayo Santamaria area will not reopen untilOct. 15, and there's been no date set for reopening the airport that serves the important Cayo Coco areas north of Ciego de Avila. Cuban authorities have said they will prioritize spending in areas that generate income, such as tourism. “The Cuban tourism sector is dead in the water on its goal of hitting 4.7 million tourists in 2017,” said Morales, adding that Irma caused more damages to the island's tourism industry, controlled by the armed forces, than U.S. President Donald Trump's sanctions announced this year. The collapse of U.S. tourism not only affected government enterprises, which pocket about 35 percent of the revenues, Morales said. U.S. companies get 33 percent of the profits and the island's private sector receives 32 percent. “The official news media has estimated that 70 percent of the four and five-star hotels on the island were impacted directly or indirectly,” Morales' consultancy reported. He added that the Cuban exile community might play an important role in the country's economic recovery, if the government creates the legal framework required for its assistance and investments. Cubans abroad have helped to fuel a private sector on the island which, after seven years of timid government openings, is now estimated at $2.5 to $3.8 billion. Omar Everleny Perez, former director of the Center for the Study of the Cuban Economy in Havana, said he nevertheless expected the damages to the hotel sector will be overcome quickly. The outlook on the agricultural sector is even more complex. Reports in the Cuban media indicate that more than 40 percent of the sugar cane fields were lost and the plantain, orange, grapefruit, lemon, tobacco and coffee fields were hard hit. Nearly one-third of the sugar mills were impacted and 13 were in “very grave” condition. Even before Irma hit, Cubans were already facing chronic shortages because of several factors, including a $1.5 billion cut in imports during the first six months of 2017. Perez said the the cut in imports could worsen unless the government takes urgent steps such as declaring a state of emergency and easing restrictions on the importation of specific products. “The government could lift import duties on goods needed by the families affected, like mattresses, home supplies, construction materials or food,” he said. Other welcome measures, he added, would include the quick approval of private construction cooperatives and suspension of all fees on self-employed Cubans for at least three months. For Morales, the country's economic crisis requires more, “profound legal transformations” that will open the economy to free enterprise and the flow of investment capital. “The solution is not to punish the private sector. If China and Vietnam pulled more than 350 million people out of poverty in less than 25 years, why can't Cuba pull out 10 million in less than five years,” he asked.